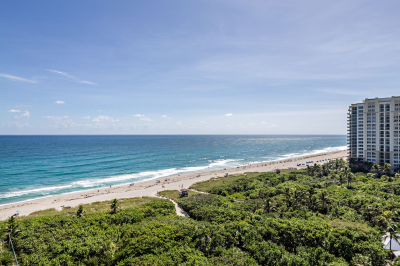 This world class luxury waterfront residence, with 24 hr security, occupies the entire 12th fl and this height showcases amazing views of the Atlantic Ocean, sandy beach and Intracoastal Waterway. The key access controlled elevator takes you to your private foyer and as you move through the secured double doors into the open great room, the endless floor to ceiling glass windows captures the ever present sandy beach and crashing waves. This home is tastefully decorated in neutral tones including natural stone travertine flooring throughout including the master bedroom suite. Amenities include updated fitness center, owners' lounge, professional tennis court, oceanfront heated pool with whirlpool and spa, and beach access. Just minutes away from airport, shopping, golf and restaurants.